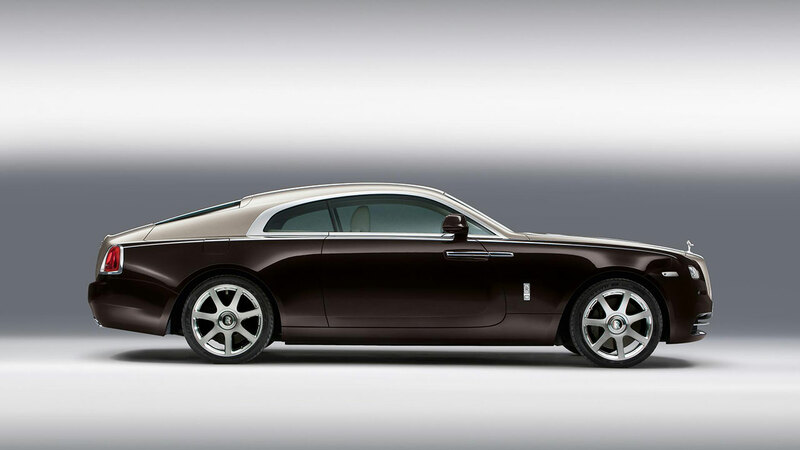 Rolls-Royce Motor Cars proudly presents the world debut of Wraith, the most powerful and dynamic Rolls-Royce in history. At its heart lie hallmark Rolls-Royce attributes of luxury, refinement and hand-craftsmanship, but the new model from the world’s pinnacle super-luxury marque also presents a unique character defined by power, style and drama. With just a hint of the noir. 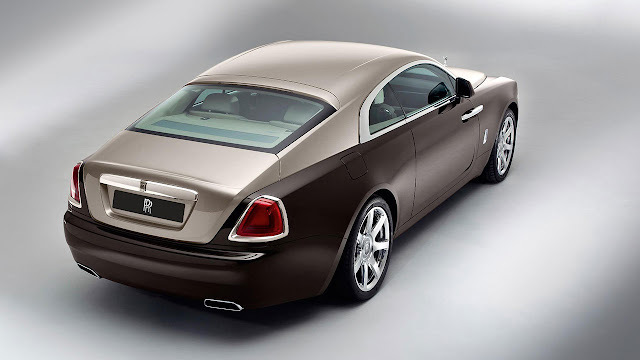 In profile, Wraith’s sweeping fastback design gives the car its unique character. Bold lines, tension in the panels and a raked rear screen evoke the image of a world class athlete poised in the starting blocks. Further expression of dynamic intent can be seen in Wraith’s deeply recessed grille, wide rear track and dramatic two-tone presentation. 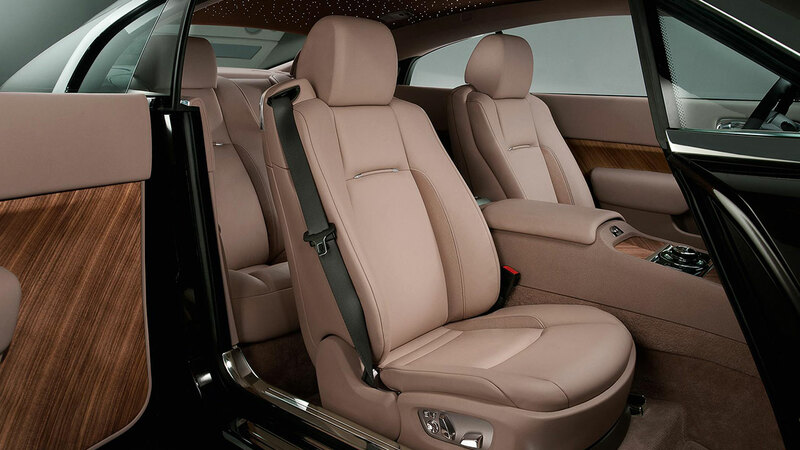 Coach doors open to reveal a sumptuous interior complete with softest Phantom-grade leathers and expanses of wood called Canadel Panelling. Named after the famous cove in the South of France where Sir Henry Royce and his design and engineering teams spent their winters, this contemporary and tactile finish sweeps through the interior, cosseting four occupants in a space bathed in light and warmth. 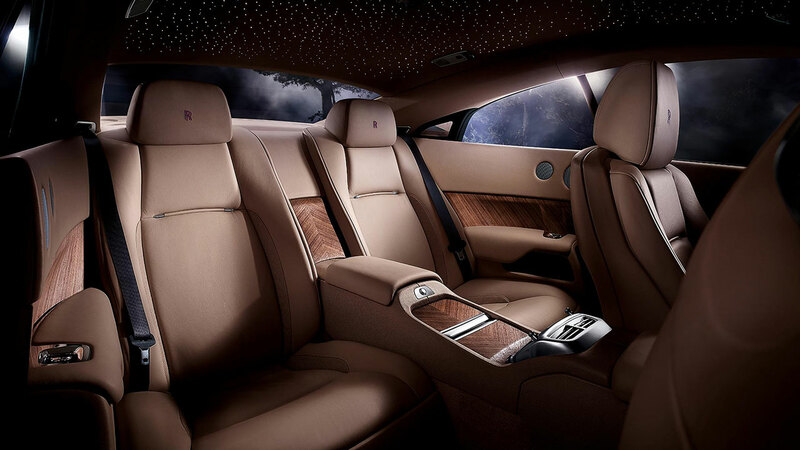 The interior ambiance is complemented by Starlight Headliner, a Bespoke feature available beyond Phantom family cars for the first time. 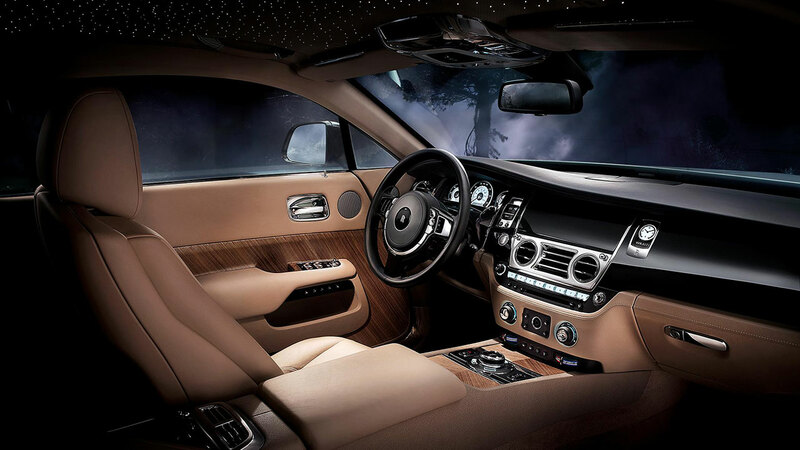 1,340 fibre optic lamps are hand-woven into the roof lining to give the impression of a glittering, starry night sky. Performance delivers on the promise of Wraith’s styling. Power delivery is effortless, but dramatic, thanks to a V12 engine married to 8-speed automatic ZF transmission. 624 bhp / 465kW is available to the driver while the 0-60 mph sprint is achieved in 4.4 seconds, compared with 563 bhp / 420kW and 0-60 in 4.7 seconds for Ghost. From 1,500 rpm 800 Nm of torque is available (780 Nm for Ghost), while a wide rear track, shorter wheelbase and lower roof height further contribute to the most powerful, involving driving experience of any Rolls-Royce in history. The car’s suspension has also been tuned to minimise body roll and discreetly amplify feedback when cornering; while steering weight is heavier at high speeds and lighter at low speeds adding to the spirited drive. However, Wraith is no GT bruiser. Agility improvements have been achieved with absolutely no compromise to the sensation of riding on a bed of air. Furthermore, the debut of Satellite Aided Transmission (SAT) technology takes the powertrain to a new level of effortless delivery, one that perfectly suits the Rolls-Royce brand. Satellite Aided Transmission uses GPS data to see beyond what the driver sees; it anticipates his next move based on location and current driving style, then selects the most appropriate gear for the terrain ahead. Corners, motorway junctions and roundabouts are all anticipated in advance meaning Wraith is constantly poised to deliver on its promise of performance. A more polished, effortless driving experience and even better response brings a new, more dynamic dimension to the famous Rolls-Royce trait, waftability. For over a century a Rolls-Royce motor car has featured technologies designed to support occupants discreetly, delivering a peerless driving experience epitomised by the term ‘effortlessness’. In every Rolls-Royce these assist the driver when called upon, but are prepared to return without fuss to the background when no longer required. Advances in mechanical and electrical technology deliver systems like head-up display, adaptive headlights and Wraith’s keyless opening boot. But improvements in connectivity have taken the human-machine interface to a new level of sophistication, a suite of aids that could be likened to a contemporary on-board valet. Additional improvements in communications come in the design and functionality of the elegant Spirit of Ecstasy Rotary Controller. This allows navigation through on-screen functions using a touch pad that features pinch and pull functionality to echo smart phone usage. Letters can also be ‘drawn’ onto the pad by hand rather than by scrolling through a series of available characters on-screen. In Europe, Wraith will be priced at c. €245k. Confirmation and further pricing details in all markets will be revealed later in the year. 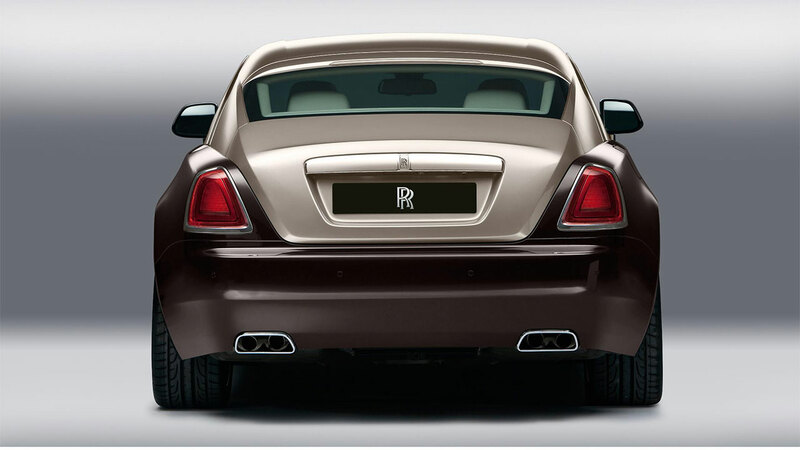 First deliveries of Wraith will be made to customers in the final quarter of 2013.